The MMKAC senior men made club history by qualifying for the English Road Relay Championships which were held in Sutton Park, Birmingham. The team finished a very encouraging 34th from the start field of 68 clubs. 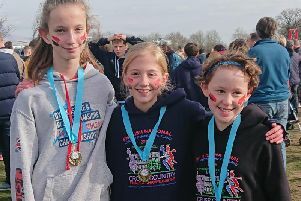 They had to make three changes from the team that placed 11th in the recent South of England Championships including one late the previous evening. Athletes ran alternate laps of 8.96km and 5.14km. Tom Comerford ran the opening leg to come home 32nd with a time of 27:50 and handed over to Ian Wood who ran their fastest short leg with 16.56 gaining one place. Paul Mizon ran the team’s fastest “long” leg with 27:44 on the 3rd lap moving up to 29th. The other ”long” legs were ran by Eliott Hind (28:10), James Tuttle (29:09), Jamie Seddon (28:56) and Tom Cuthbertson (30:36). The remaining short stages were run by Jeremy Vick(17:42), Ross Threlfall (17:39), Mark Palser (17:58), Steve Ratcliffe (18:35) and Steve Martin (21:19).